At World of Concrete 2016, Geith talked to us about its progressive linkage (pro-link) hydraulic thumb, which provides up to 180 degrees of rotation, allowing operators to pick up and place rocks, tree stumps, pipes and other irregular shaped objects closer to the excavator. The extended range of motion provides for greater grabbing ability. 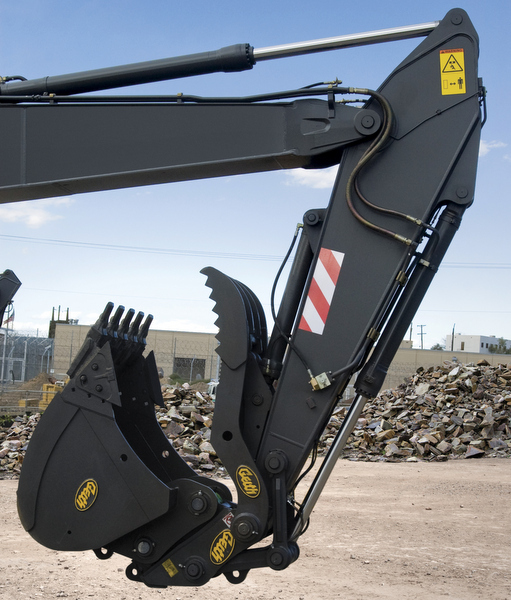 The Universal Linkage Pivot System allows the pro-link thumb to be installed on any excavator arm without removing of the dipper arm linkage. Manufactured with high-strength steel, the pro-link thumb’s strong, rigid structure and oversized high-profile pivot pin increase torsion resistance. In addition, integrated linkage positional stops protect the hydraulic cylinder from damage, while a lock-up pin enables operators to safely secure the thumb in a storage position when not in use. The induction-hardened-chrome hydraulic cylinder rod ensures durability, extending the working life of the pro-link thumb. To learn more and to watch the Geith pro-link hydraulic thumb in action, visit www.geith.com.